Stuart Larsen at Fraser Yachts sends news that, following her 15 years Lloyds survey and significant mechanical and technical upgrades last autumn, the 60.66m motor yacht Méduse is now back on the market. 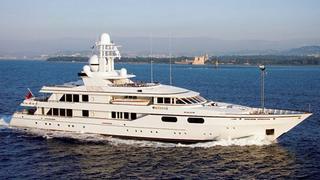 Built by Feadship’s De Vries yard in 1996, she was thoroughly refitted in 2006. This superyacht was conceived to replace the owner’s smaller Feadship and specifically designed for serious world cruising. Carrying a large helicopter and with a diving recompression chamber, elevator, cinema, gymnasium and two staterooms on deck, plus four other guest suites and a nanny cabin, Méduse has a very versatile layout for 12 guests. She has cruised extensively across the world’s oceans and is known as one of the most sea-kindly and handsome Feadships, with twin 1710hp Caterpillar engines giving her a range of 5,380 nautical miles. Lying in Palm Beach, Méduse is asking $34.5 million.